Average Height	: 20" - 25"
Average Weight	: 60 - 85 lbs. 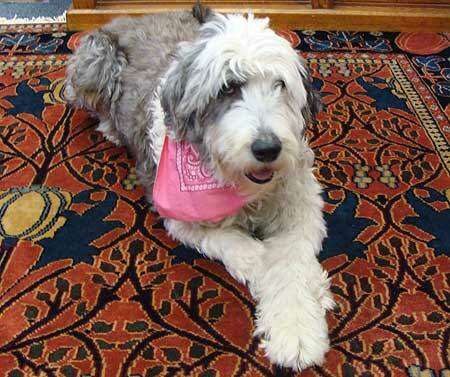 Photo Courtesy of : New England Old English Sheepdog Rescue, Inc.
Dixie Old English Sheepdog Rescue, Inc. There are a few theories about the origin of the Old English Sheepdog. The Old English Sheepdog has been used as a herding dog and pet for thousands of years in Europe. There are many theories as to the true origin of this dog, and many believe that it is related to the Barbone and the Deerhound. Others think that it may be related to the Briard or Bergamasco, as well as being a descendant of the hairy Russian dog known as "Owtchar" that was brought to the United Kingdom from the Baltic region. Another theory.... is that it is related to the Poodle and the Deerhound. Other theories are it is related to the Briard and the Bergamasco, or from Scotch Bearded Collies and the Russian Owtchar, a hairy Russian breed brought to Great Britain on ships from the Baltic. It is likely that cross breeding occurred throughout England and Russia, especially with the Bearded Collies and other animals brought in from France and the Baltics. The Old English Sheepdog was first used by many farmers in England's West Country, the groups of people in need of cattle drivers and natural sheep herders. The breed became very common in the 19th century, and has been used widely in many agricultural areas. The Old English Sheepdog was developed in the western counties of England by farmers who needed a quick, well-coordinated sheep herder and cattle driver to take their animals to market. The dogs became widely used in agricultural areas. Farmers began the practice of docking the tails in the 18th century as a way of identifying the dogs that were used for working so they could get a tax exemption. For this reason the dogs were given the nickname "Bobtail." The Old English Sheepdog has been used as a herding dog and pet for thousands of years in Europe. There are many theories as to the true origin of this dog, and many believe that it is related to the Barbone and the Deerhound. Others think that it may be related to the Briard or Bergamasco, as well as being a descendant of the hairy Russian dog known as "Owtchar" that was brought to the United Kingdom from the Baltic region. The dog has often been called the "Bobtail" because of it's lack of a tail or short stump. The dog's tail was customarily docked as a way to identify tax-exempt herding dogs during the 18th century. In the spring time, farmers often sheared this dog along with the sheep and then used the dog hair to make blankets. Clothing and blankets trading were another part of the old English economy, and the prevalence of the Old English Sheepdog made this a natural commodity. The Old English Sheepdog has also become famous for herding, watch dogging, and retrieving. Still, it is a fine herding dog and one that has even been used for reindeer herding because of its ability to tolerate cold weather. Show dogs are another popular activity for these dogs; they were first shown in Britain in 1873, and are well-received in a variety of competitions and show dog circles. The Old English Sheepdog has a strong work ethic and naturally stays busy. They are energetic both indoors and out, and although they welcome attention, they also fare well by spending time on their own and staying busy with activitieis. The breed has historically been recognized as fierce, untrustworthy, and undependable. However, they are naturally gentle and loving, and have proven to be wonderful family members and pets. The dogs have a strong herding insticnt and may even attempt to herd family members nad young children. It is important to train them to respect other people in the household, and this must be done at an early age to avoid missing the prime learning opportunities. The Old English Sheepdog tends to stay close to home, and will rarely venture off on their own. These dogs are strong-willed and will overpower their masters and owners if they are not managed appropriately. These dogs take instructions very well, and will anticipate commands at times. They are independent and can become gruff; it is important that they are given formal instructions and they can become quite submissive with the right approach. Motivation works well for the Old English Sheepdog, and they will enjoy consistent attention and formal training. The bark of the Old English Sheepdog is quite unique, and has similar sounds to a cracked bell. The breed continues to be a "young" type with plenty of energy and a high affinity for learning. These dogs make wonderful family companions and love children. They are naturally intelligent and understanding, and will follow direction when they understand the lines of respect from their master. They are bubbly and playful by nature, and are especially intuitive. The Old English Sheepdog has a course, longhaired coat and needs constant care. They do need to be brushed and combed at least three times per week, as their long shaggy coat can attract dirt and debris very easily. This dog is known to develop skin problems and the hair will become matted if it is not well-maintained. These dogs are commonly used as showdogs, and will require the services of a professional groomer for the appropriate care. It is important to clip out any tangles very carefully on a regular basis, as these can cause discomfort after a period of time. The coat can be professionally machine-clipped every two months, and will need to be trimmed to at least one inch all the way around. These dogs were once sheared along with sheep, and they are most attractive with a medium-length coat year round. It is important to trim around thee eyes and the rear-end with blunt scissors to avoid cutting into the skin by mistake. The Old English Sheepdog sheds most heavily during the spring season in April and May. Regular trimming and bathing is recommended, and this can be completed with a professional grooming service. The dog is well-suited for ongoing care, and will not "put up a fight" for baths or getting wet. It is important to train them to experience bathing in a positive way in their early years. In addition, it is important to check for ticks during tick season, and ongoing trips to the Vet will surely take care of health problems. If the dog will not be used for showing, simply cutting the dog's hair with a professional electric shear is all that is necessary. The Old English Sheepdog enjoys working hard and the ideal exercise is a long run or jog with their owners. It's important to maintain their endurance and stamina, and the dog will rarely miss an opportunity to race and be outdoors. A natural herder, these dogs will work outside for hours if needed. They are best suited for a medium-sized yard, but if there is none available, they just need a regular opportunity to exercise! Staying busy comes naturally to them so having toys and other objects available is a good idea. A long brisk walk twice per day is ideal; a run incorporated into their exercise regiment will help them become strong and maintain good form throughout the year. Water must always be available for these dogs, especially in hotter climates when their long coat can cause them to overheat. They are best-suited for cold and cooler climates, and will enjoy activities indoors during especially harsh weather. Keeping them moving and motivated to play is important for their health, and they are less likely to resort to destructive or unhealthy activities as a result. These dogs enjoy running outdoors in even cold climates, and their long coat is naturally protective to help them to do this. These dogs are naturally quite intelligent, and will not get lost easily. They are naturally curious but also know their boundaries. Owners who enjoy plenty of exercise themselves will do well as the owners of the Old English Sheepdog as they can take part in many outdoor activities together. The Old English Sheepdog makes a valuable companion to any busy owner, and they can be trained to perform a variety of tricks, skills, and take on tasks. They perform best when they have a job to do, and they are particularly attuned to their owner's needs. These dogs are most well-behaved when they are happy, and they will rarely be aggressive unless they are threatened or hurt. The Old English Sheepdog is naturally intelligent and will enjoy ongoing training and growth. They learn quickly and they will get along well with most owners an trainers. Since they do have natural herding instincts, they have a natural drive to work and take on new tasks. They are also very strong-willed and stubborn, so it is best to teach them positive habits at a very young age. Trying a variety of training methods works best for them since they can become quite grounded in routines. Motivational training is a good idea for these dogs, and they will continue to stay interested, alert, and attentive. The dogs are good at managing challenges and overcoming difficult tasks; they are also helpful and will fare well with working with their owners. These dogs enjoy learning new tricks and skills, and will develop their personality very quickly. These dogs are sensitive and will respond to correction and harsh tones. It is important to be firm and confident with them, but they will listen to their masters and owners, especially when they have learned boundaries and lines of respect. It's important to remember that these dogs are even tempered and very faithful; they have a tendency to develop a strong bond with their owners and will fare well with ongoing encouragement, nurturing, and attention. Overcoming training difficulties may take time and patience, but the reward is a very affectionate and well-behaved dog.